The book was based on Boyd’s World War I experiences in France where he fought at Belleau Wood and St.-Mihiel, and was with the first American advance through the wheat field at Soissons. He was gassed during one battle, and after the war, he received the Croix de Guerre from the French government. Born in 1898 in Ohio, Thomas Alexander Boyd quit high school to join the Marines Corps at 18. After the war, he worked for newspapers in St. Paul, Minn., and opened a shop called Kilmarnock Books, a name perhaps recalling his ancestral home in Scotland. The store became a literary center, frequented by the likes of Sinclair Lewis and F. Scott Fitzgerald, both of whom urged the war veteran to write about his combat experiences. Boyd moved to Ridgefield in 1925 to be near Maxwell Perkins, his editor at Scribner’s. He turned out a series of biographies of notable Americans, including “Simon Girty, the White Savage” (1928), “Mad Anthony Wayne” (1929), “Light-Horse Harry Lee” (1931). The best reviewed biography was “Poor John Fitch, Inventor of the Steamboat” (1935), published posthumously as was a sequel to “Through the Wheat,” called “In Time of Peace” (1935). Like many novelists of the time, Boyd also wrote for “the pulps” to make ends meet. His wife, Margaret Woodward Smith, was often co-author. By the 1930s he was divorced and living in Vermont, where, concerned about the future of the country in the midst of the Depression, he joined the Community Party and at one point ran for governor of the state on the Communist ticket. He returned periodically to Ridgefield and died of a cerebral hemorrhage in January 1935 at his former home on North Salem Road where he had been staying while his ex-wife Margaret and her husband, Ted Shane, were in Hollywood working for MGM. He was only 37 years old. “The New York critics declared his death a loss to American literature,” his obituary in The Ridgefield Press said. Tom and Peggy Boyd had one child, Elizabeth Grace Boyd Nash, who for many years was an editor of The Ridgefield Press. His grandson, Thomas Boyd Nash, became publisher of the newspaper in the 1990s. In 1978, “Through the Wheat” was republished as part of the Lost American Fiction series, produced by the Southern Illinois University Press. 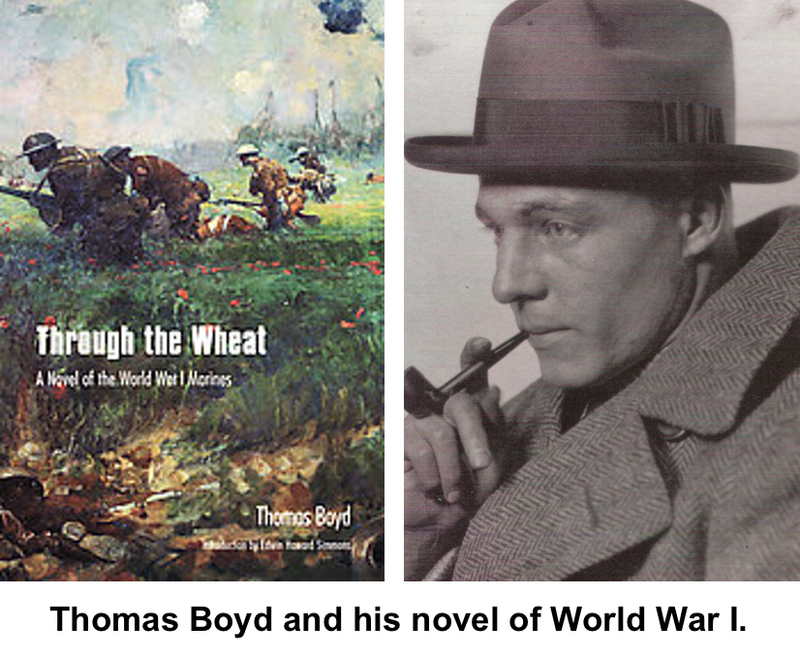 The book is still in print, now titled “Through the Wheat: A Novel of the World War I Marines,” published by the University of Nebraska Press. In 2006, Brian Bruce’s biography, “Thomas Boyd: Lost Author of the ‘Lost Generation,’” was published by the University of Akron Press.